Help yourself to the continental breakfast as well as the cooked section. A range of kiwi favourites including hash browns, bacon, sausages, eggs, pancakes,spaghetti or baked beans and more! Also includes free filter coffee, tea and juice. Help yourself to a variety of cereals, toast, fresh fruit and yogurt. Also includes free filter coffee, tea and juice. 2 pork sausages, 2 hash browns, 2 eggs any style, baked beans, sautéed mushrooms, thick toast and grilled tomato. 3 egg omelette with your choice of 3 fillings; ham, tomato, smoked salmon, cheese, onion, mushroom, served with crusty bread. 2 fried eggs on toast with 2 hash browns served with ONE of the following - bacon, sausage, grilled tomato or mushrooms. Dusted with cinnamon sugar with grilled bacon and maple syrup. 2 poached eggs on toasted loaf with hollandaise. Vanilla pancakes with either fried banana, bacon and maple syrup or berry compote, banana & whipped cream. Topped with yogurt and fresh fruit. Baby Breakfast with bacon and hash brown on toast. Eggy Bread 1⁄2 pint French toast. Pee Wee Pancakes with banana and maple syrup. Humpty Dumpty scrambled egg on toast. seasoned with black pepper and mushroom served with crispy bruschetta and parmesan bark. Crispy fried oysters with aioli, steamed green lipped mussels with coriander vinaigrette, deep-fried prawn twizzle, smoked salmon wings with chilli sour cream, coconut shrimp, salt and pepper honeycomb squid with lemon mayo, pan seared sea salmon with ponzu soy, steamed garlic shrimp. Served with bruschetta and crisp parmesan bark. Baby caper berries. Meats all your needs!” Grilled lamb skews w Greek tzatziki, prosciutto on grissini, grilled teriyaki beef fillet, grilled chicken in basil pesto, pepperoni, spicy chorizo and chicken liver pate. Served with bruschetta and crisp Turkish bark. Baby caper berries, Spanish onions and warm Kalamata olives. this hand-crafted onion flower is fried until crisp and golden brown.Then it’s up to you to pluck the petals off and dip them into our famous cocaine mayo. with pickled cucumber, chilled rice cake and spicy peanut sauce. Fried crispy and served with chilli sour cream. 2 flaked fish & corriander coleslaw taco's with crispy capers and smoked mayo. seasoned with black pepper and mushrooms, served with crispy bruschetta and parmesan bark. with home-made sweet chilli sauce. The proof is in the crunch, served with lemon syrup dipped sauce. Tender shrimp broiled in butter with garlic & spices on jasmine rice. Pot of garlic shrimp - Peel 'n' eat! Loads of broiled shrimp loaded with garlic and fresh thyme. Juicy fat beef patty, bacon and cheddar on a pretzel bun with guacamole, red onion and pickles. Char-grilled Swiss brown mushrooms with gruyere cheese between two potato rosti crisp salad greens, tomato and avo-mayo. American rye filled with warm corned beef, Swiss cheese, sauerkraut and Russian dressing. Char-grilled beef sirloin steak with cheese melt, onions, fried egg, tomato and avocado on toasted ciabatta with garlic butter and smokey BBQ ketchup. Fritters chocka with whitebait between soft white bread seasoned with tangy lemon mayo and crisp bulb fennel salad. Roasted pork belly with grilled onions, apples and fermented red bean chilli dressing. All dishes served with your choice of Bealey slaw or seasonal vegetables, French fries - or - jacket potato with sour cream - or - bacon and chive potato croquettes - or - gratin potatoes. hand-rubbed with Alabama seasoning slow-grilled and basted with smoky BBQ sauce. includes your choice of any two ‘add-ons’ below. capped with Dijon and onion on red wine jus. Prime beef fillet stuffed with Pacific oysters wrapped in bacon and served on a rich red wine sauce. on sweet chilli apple chutney. with a peppery mushroom cream sauce. braised in Guinness with mushrooms and garlic then chargrilled. with espresso ice cream coconut whip. Smooth banana and toffee cream layered with vanilla sponge, ice cream and praline soil. with mango sorbet almond candy crunch. with maple syrup and maple walnut ice cream. with peas, sweetcorn and carrots in a creamy cheese sauce. Fish ‘n’ chips ya mum will love you eating! Crumbed fresh fish and chip made from potatoes and vegetables. Hawaiian pizza with a sneaky secret - vegetables! Bealey Fried Chicken Fillets wrapped in veg, but you’d never know! with lemon butter and roasted cherry tomatoes. Broiled in low-sugar bbq sauce – This will stain white clothing so be careful. Lindauer Brut, Lindauer Fraise & Lindauer Sauvignon Blanc. The Bealey is a laid back and eclectic bar, exceptional for your next function. With inspiration from the life of Samuel Bealey, a 19th Century Christchurch Superintendent, the venue features raw materials to evoke a sense of stepping back into historical Christchurch. 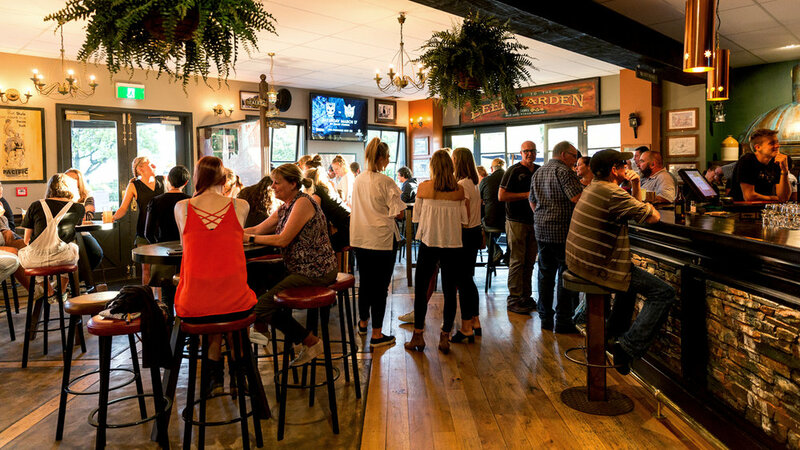 The Bealey makes for a perfect place for a function as it boasts free parking, many welcoming spaces including an open plan restaurant, large bar and a private function room. Join The Oxford Club for exclusive members-only deals.